As the oldest winery in El Dorado County and on the national registry of historical buildings, Boeger winery is a must-stop destination for wine tasters traveling in the Placerville area. Meet Greg Boeger, owner of Boeger winery and learn how he went from a UC Davis viticulture graduate to a vineyard owner with 15 different bottlings and 30 different varieties of grapes! CA GROWN: Tell me about the history of the company and your role there. Greg: We started in 1972 when we bought a pear ranch from a 5th generation farming family. It helps to know a little history about El Dorado County, which has gone through cycles from the gold rush to the present. The area was known for its pear production, which peaked­ in 1959 with 5,000 acres of pears. A few years later pear acreage began to decline and the agricultural community was looking to find a way to preserve agricultural land in the county. I had just graduated from UC Davis with a viticulture and ag economics degree, and was looking for a place to start a vineyard. I met with the Ag Commissioner and Farm Advisor and they helped me find the property that I eventually bought. The property was the site of a historic winery and vineyard that produced wine from 1860 to 1920 before converting to pears. I began farming pears and at the same time started planting a vineyard on the unplanted acreage, and built the winery in 1974. We gradually phased out the pears and planted more vineyards. An opportunity came up to lease a small winery, so that was helpful until I could get my winery into production. Eventually other wineries came into the region. When we started there were only 6 acres of grapes in the county. 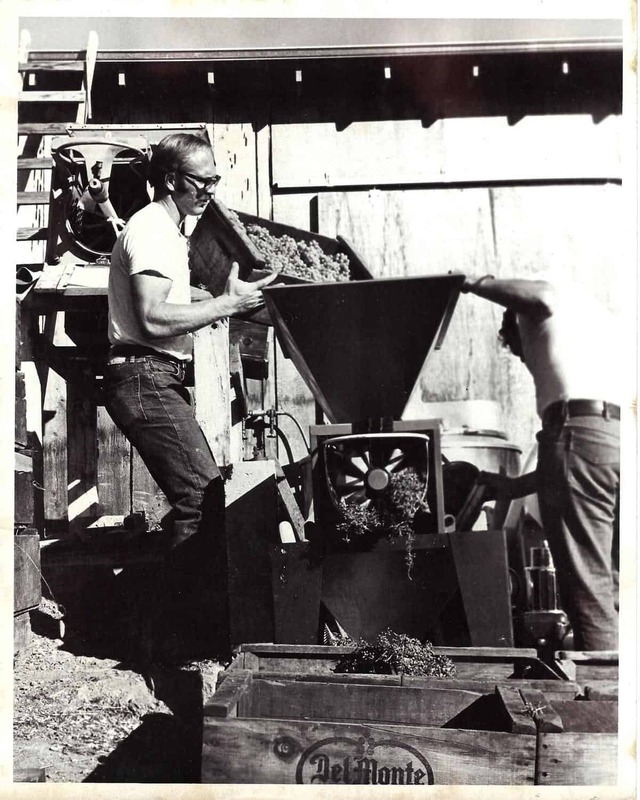 Now, 45 years later, there are over 60 wineries and 2,300 acres of grapes. Greg: There is rarely a typical day. The first thing I do is talk to my vineyard foremen and make sure we are on the same page as to what needs to happen for the day. Then I’m in my office, answering emails and placing orders. From there, I’m in my shop making equipment repairs and out in the fields talking to the workers. Always being flexible, the workday is divided between my son (who also graduated from UC Davis) and me. My son is now the winemaker, and I am in charge of the vineyards. Just trying to stay on top of everything and remaining flexible, describes my day at work. Greg: The whole family is involved in the community. I have served on several boards and committees, such as the Chamber of Commerce and the El Dorado Winery Association. I currently serve as the Chairman of the Agriculture Commission. We meet once a month and any agriculture issues in the county are brought to us for review and to make recommendations to the Board of Supervisors. My daughter is the VP of the El Dorado Winery Association, and chairs the PR and Marketing Committee. We participate in wine tasting events and donate to local charities. The family members volunteer on various committees and boards. My wife is very involved in the Apple Hill Association. She is also working hard on getting a Buddhist Monastery started in the county. CA Grown: What drew you to the farming profession? Greg: My grandfather started a vineyard and winery in Napa in 1890. I worked the family vineyard and winery as a kid. My extended family members were all California farmers and I would also spend summers at my cousin’s, farming apricots and prunes in San Jose. I studied International Ag Development at UC Davis. Then I took some viticulture courses and started to focus on ag economics. I started making my own wine with an acre of grapes that I planted on the family property. My first job out of college was with the USDA and I did that for about 18 months. From there, I started looking for land to buy and ended up here. Greg: Well I have a few. Fly fishing is something I have done since I was young. Every year I take a fly fishing trip with friends. I also restore old tractors and old cars. The tractors I restore are put to use in our field work. I have several old cars that I have restored and we display them from time to time at events. CA Grown: We know that you have a long list of activities you undertake on your farm to care for the land and your community. What is just one or two of the most innovative that you are really proud of? Greg: We have an irrigation management program where the vines are monitored with neutron probes to ensure proper irrigation. It enables us to save water by only irrigating with the correct amount of water to maintain healthy vines. We also have an Integrated Pest Management Program advisor who tells us when and what we need to spray so that it will have minimal impact on the beneficial insects in the vineyard. We are a certified fish friendly farming operation which means that our farming practices are compliant to prevent erosion so streams are not affected negatively by our farming operation. We also have wildlife corridors and habitats to protect the wildlife environment. CA Grown: What is the most rewarding part of your job? Greg: We have a very hilly terrain and getting on top of the hill and looking out and seeing the vineyard healthy and growing is very satisfying. My family is fully involved in the business and passing it onto the next generation is very rewarding and satisfying. Our employees have the same work ethic and continue to also pass on their work from generation to generation. I feel like we are all one big close knit family. CA Grown: What is unique about your farming operation? Greg: We are 100% family owned and managed. We are the oldest winery in El Dorado County and are on the national registry of historical buildings. The original home and cellar is still being used. We grow over 30 varieties of grapes and one focus has been on the Barbera variety since 1975. We also focus on other Italian varieties. CA Grown: How do you go about producing good wines that bring so much enjoyment to people? Greg: We have 15 different bottlings utilizing 30 varieties of grapes. There’s a wine for everyone in our offerings. We also have a wine club with over 2,000 members. The challenge is to find a wide selection to serve our wine club members and keep them interested and involved in our offerings. CA GROWN: What would you say has contributed to past success and what are some things being done to ensure continued success? Greg: Our continued success has been the ability to stay on top of the market. Having my son and daughter involved has been extremely important. They help us stay on trend, knowing what is current and what people want, and how to stay ahead of the curve. My daughter has had a lot of input in our marketing efforts and unique label designs. My son stays on top of current technology. We recently hired an Assistant Winemaker with a master’s degree from UC Davis, and he has also helped us maintain consistency, quality and to investigate up-and-coming trends. Originally, we happened to be in the right place at the right time in El Dorado County. The community was behind us every step of the way and it was good timing. My wife is instrumental in keeping us financially sound. She went back to college at Sacramento State for graduate courses in finance and business and brought those skills back to the winery which has helped us remain profitable. Family effort and good employees make it all work. CA Grown: What advice would you give to someone who wants to get into farming? Greg: Get a good, well-rounded education. Not just in farming, but include economics and history. You will benefit from having a wide breadth of knowledge to draw on in this industry. You meet people from all walks of life and it helps to be able to converse on different levels. Work with a vineyard or winery to get practical experience. Learn from others how to properly farm the land. Once you buy land, start small and make mistakes on a small scale. Don’t go so big the first time around. Have a love of the land and the place you live to keep it for future generations.